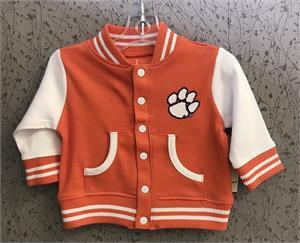 Adorable orange jacket with white sleeves looks like a varsity jacket but is soft and comfy for your favorite Tiger baby! Wonderful gift that is cute as can be! Store is located on 123 in the Hamrick's shopping center.